← Wood Butter – A Recipe for Your Utensils! 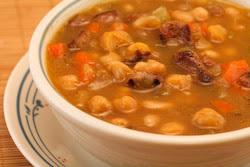 I make this bean soup with turkey bacon (I don’t eat pork) but you can use ham hocks or regular bacon. 1) Rinse beans well, pick over to make sure there are no small rocks. Place beans in pot of cold water with one large piece of Kombu seaweed. (seaweed is optional). Slowly bring to boil. Let sit while you are starting other ingredients. 2) Sauté bacon in butter until cooked but not crisp. Remove from pan, set aside. Sauté onions in 2 Tablespoons butter over low heat, covered, for 1 hour. 3) Drain beans, add to caramelized onions. Add stock, carrots, all other ingredients. Add water as needed to cover plus about 2 inches over beans. 4) Simmer slowly until beans are tender. Remove 1 cup of beans, blend in blender with some stock, add back to soup. Adjust seasonings. Serve with Gluten Free corn bread and sautéed kale with onions.